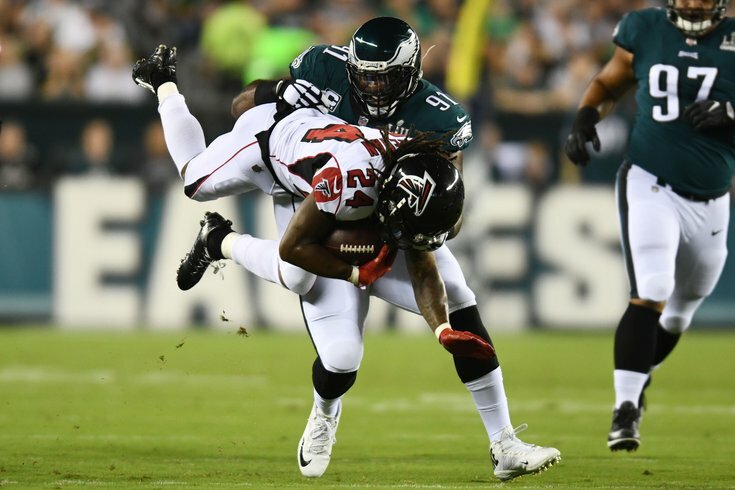 Philadelphia Eagles defensive end Fletcher Cox tackles Atlanta Falcons running back Devonta Freeman (24) in the first quarter at Lincoln Financial Field. Despite a pregame filled with spectacle and a crowd ready to lift the Eagles to greater heights, the reigning Super Bowl champions came out and had quite a boring half against the Atlanta Falcons. A sleepy half from the offense leaves the Eagles trailing their feathered foes from the south 6-3 after 30 minutes. • Let's get one silver lining out of that weather delay — the city of Philadelphia would have had an effing meltdown if Carson Wentz returned to play in Week 1, only for him to have to get his first game reps in nearly a year on a slick Lincoln Financial Field. Forget whether he was physically ready to play, nobody was mentally ready for the anguish of watching him plant on soggy grass yet. • The Eagles' defense did not get off to the strongest start in the world, witth Julio Jones and DeVonta Freeman combining to push the Falcons deep into Philadelphia territory. Jim Schwartz's boys can at least partially credit the opponent for what happened from there — how in the world do you not have Jones in for a single red-zone play? Still, the defensive front tightened up when it really mattered, and credit to Kamu Grugier-Hill for shedding several Falcons blockers before ultimately making the tackle on Freeman that ended the drive. • While a lot of his peers on both sides of the ball looked a little sluggish in the earlygoing, Ronald Darby looked excellent out of the gate. He made great reads in breaking up or disrupting several passing plays, and was one of the few members of the secondary to show any sort of proficiency as a tackler early on. His first season in Philadelphia kicked off with an ankle injury that kept him out of action until Week 11, so if Darby can simply stay on the field and show the talent the Eagles banked on when they acquired him, the week-to-week chemistry alone will help the Eagles secondary grow into more of a strength. • Fletcher Cox may be built and hit like a defensive linemen, but sometimes he moves and thinks in ways that make you forget exactly what his job responsibilities are. He was locked in a trenches battle on a third-down play early in the second quarter, but the All-Pro tackle was aware enough to see a screen play developing for Freeman. Cox isolated Freeman, froze the running back, and the Falcons ended up losing a decent amount of yardage on the play. That's why that man gets paid the big bucks, even if he had some help from his friends completing the play. • There has never been any doubt about Jason Peters' desire to get back into the form we all expect from him, but to see him come out and play at the level he did on opening night? Man. That's not just Hall of Fame talent, that's Hall of Fame work ethic and leadership. There should be no question why he has been one of the pillars of leadership in the locker room for his entire Eagles career. • Cameron Johnston looked great in the first half, which is not the sort of thing you want to be writing about when you're covering the hometown team. But good for him. • Eating a gnarly stiff arm from Julio Jones is probably not how Rodney McLeod wanted to start his season. The potential interception that bounced off his hands late in the first quarter was also a huge missed opportunity, and could have given the Eagles some needed life as their offense sleptwalk through the half. • The catch Doug Pederson challenged midway through the first quarter was debatable to some extent, I'll give him that. But to use a precious challenge that early in the game on what would have at best saved the Eagles three or four yards — with no possibility for a first down anyway — is a mind-numbing decision. Pederson has earned plenty of benefit of the doubt, but I'm sure he'd like to have that one back. That decision, frankly, almost looked smart compared to calling a timeout on fourth and one with :11 left in the half. • The Eagles continue to have high hopes for Derek Barnett, but in year two some of the typical "rookie mistakes" are not going to fly if he wants to continue earning more reps. He was not all that effective as either a pass rusher or a run stopper, often getting into the backfield too late to make a difference. So that made it worse when he forced the Eagles to get another stop in the redzone late in the first quarter because he lined up offsides. That's an easily avoidable screw-up, and the sort of thing he'll get grilled on in the film room next week. • We're going to have to deal with a career's worth of chip shots that Jake Elliott makes the entire Philadelphia area sweat over, aren't we? Because I imagine a lot of people watching at home thought he missed that 26-yard kick that snuck between the goalposts in the second quarter. You're better tthan that, Jake, just pretend it's from 50+ out. • What to make of that half from Nick Foles? I wouldn't say it was horrendous, but he looked closer to a backup quarterback than he did to his Super Bowl MVP form from earlier this year. Frankly, that's perfectly fine a lot of the time. Foles made some really nice throws in the first half, including a beautiful lob to rookie Dallas Goedert that the tight end failed to keep in play, and he's always going to be a streaky player. The Eagles have the surrounding structure to win without Foles playing at "elite quarterback" level. But the Eagles certainly need to do a better job of putting points on the board, and maybe this first half shows the struggles for the first-team in preseason might linger for a bit — at least until the reinforcements show up. The throws Foles made were extremely conservative in most cases, and that's not going to get it done against the better teams around the league. • Big fan of Darren Sproles, happy for him that he was able to make a comeback. The usage of him in the first half seemed like a lot for an aging running back returning from a major injury. • NBC decided to introduce something called, "The Green Zone" which evidently shows the territory between the line of scrimmage and the first-down marker. What a stupid and unnecessary idea. There's a yellow line for the first down that everyone knows and loves to have, there's no need to add extra nonsense. This is worse than the glowing puck experiment in hockey. Kill it with fire, now. • Shelton Gibson got 15 yards for "unsportsmanlike conduct" on an Eagles punt, which was then explained as the reciever not returning to the field of play immediately after he was forced out of bounds on the coverage. That seems a bit excessive. • You know what I really want to see more of in the second half? Penalty flags. Love when the officials are the most prominent part of a game.